Vision: University of Michigan’s Foundational Courses will play an important role in recruiting a diverse student body, supporting them all equitably, and creating the inclusive community we aspire to for our third century. These Foundational Courses will be nationally recognized as a leading model for teaching and learning at scale. Only about 1% of the University of Michigan’s 9,200 courses enroll more than 200 students, but these courses are incredibly important. 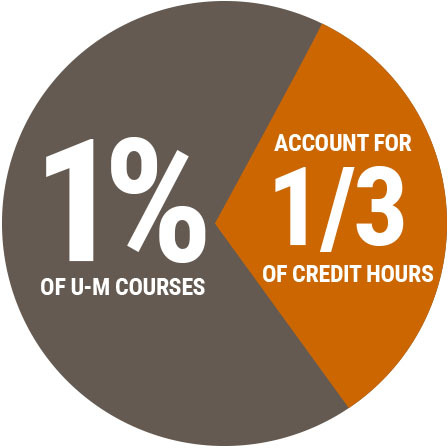 They account for one third of all credit hours, for which students pay about $150 million in tuition every term. They play an outsize role in student’s lives, providing essential gateways to majors and careers. Such courses are difficult to teach, enrolling students from a wide variety of backgrounds, interests, and goals, endeavoring to prepare them all well for subsequent study across a range of fields. Every one of these courses should have access to the support the Foundational Course Initiative can provide. 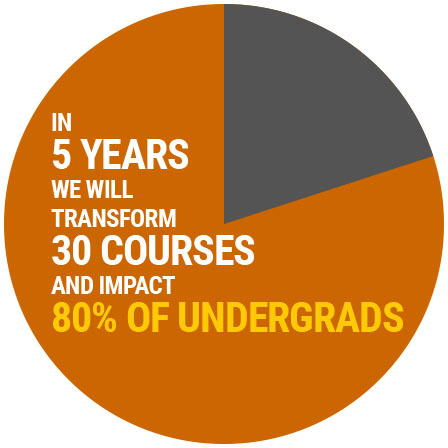 During the first five years of this initiative, we will transform more than 30 courses, significantly impacting the lives of 80% of Michigan undergraduates. By doing this, we expect both the image and the reality of large introductory courses at Michigan to be transformed. Students will come to Michigan eager to participate in well-designed and carefully delivered foundational courses. These courses will enhance student success, ensure that students can complete the degrees they desire, and enrich their experience with topics outside their major. A collaborative course design (CCD) team, consisting of a departmental instructional team and educational professionals from CRLT, will be convened for each course that joins the initiative. The group will include multi-generational instructional teams - faculty, GSIs, undergraduates, and postdocs - and experts in assessment, technology, pedagogy, and student support. In a process that will typically last three years, the team will explore the existing course and design a revised version, deliver the revised course while measuring outcomes, and iterate on the design to deliver a "final" revised course. In the third year, the team will prepare a report detailing the course's successes and its ongoing support needs. 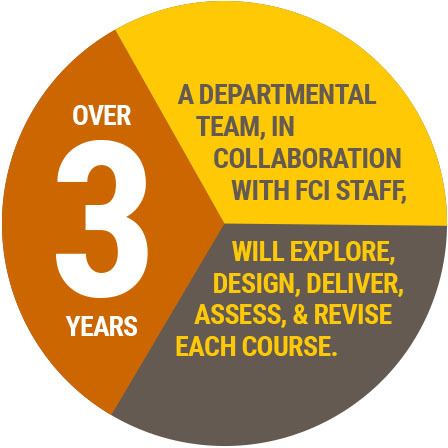 In its first year, FCI is partnering with six of the largest courses on campus. The average total yearly enrollment in these six courses is more than 3,400. The Collaborative Course Design teams for these courses began their FCI journey at an intensive Course Design Institute in May 2018 and have worked through the summer to identify research questions and course changes to implement in Fall 2018. Watch this space for updates on their progress. Learn more about the FCI.